It's been just over a week since the initial rumor that Samsung is working on a virtual reality headset appeared, and now a new report says at least one of our assumptions was wrong. 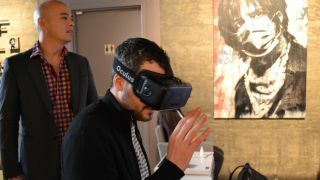 That is, Samsung is not looking to compete with Oculus VR and Facebook, but is actually working with them. Engadget, which also reported the original story, has now shared a flood of new details about what could ultimately be a Galaxy Oculus Rift - or at least something like that. The Samsung VR headset will reportedly use your phone's actual screen instead of including one of its own, but the headset will also include sensors like accelerometers and other hardware essentials. So what does Samsung need from Oculus? Software, according to this report; Samsung is allegedly getting early access to Oculus's mobile software development kit. In return, Oculus gets to use the next generation of Samsung's OLED displays in its next Oculus Rift headset. These screens are reportedly higher-def than 1080p. The Samsung VR headset will supposedly be able to play both games and media and use a paired game controller and/or motion and voice controls. The phone's rear camera could be used for video pass-through to check your surroundings in between frags, and there might even be buttons on the headset itself, including Android's standard recent apps, home and back buttons. Currently both Samsung's hardware and Oculus' software are both said to be so early that it's impossible to build full games, but devs have reportedly tried out a musical application set on a beach and a skydiving demo. Between Oculus Rift, Sony's Project Morpheus headset, and now Samsung's supposed Galaxy VR project, the virtual reality space is starting to really heat up. Wonder what we'll see at E3 2014?